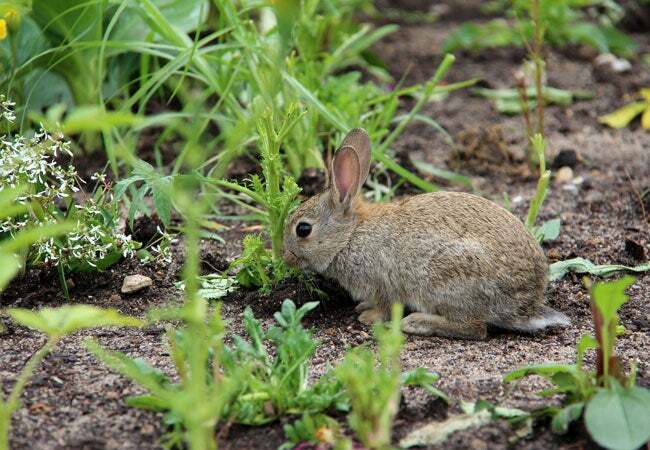 Got rabbits nibbling on your vegetable garden? Follow a combination of these four methods to safely—and humanely—get rid of them. While children love big-eared Bugs Bunny chomping on a carrot, gardeners can identify closely with his cartoon nemesis, Elmer Fudd. That’s because rabbits wreak widespread havoc on landscapes, gardens, and yards foraging for food. Razor-sharp teeth allow these herbivorous mammals to cut through vegetation of nearly any kind, including leafy green plants, carrots, broccoli, strawberries, apples, and other produce. Additionally, rabbits may dig burrows on residential properties, which can leave unsightly holes and become a tripping hazard. And rapid reproduction rates—30-day pregnancies that can create as many as 12 offspring each time—can overrun your property in just a season. As Elmer Fudd is famous for saying, “rascally rabbits” can be especially smart and elusive, making an infestation quite difficult to manage. If you have a serious rabbit infestation, call professional pest control for help. But if you spot only a few roaming your yard, ward off the beginning of a warren by following a combination of these humane methods for how to get rid of rabbits. An unkempt and overgrown yard will undoubtedly attract rabbits, since the animals take cover in tall grass. 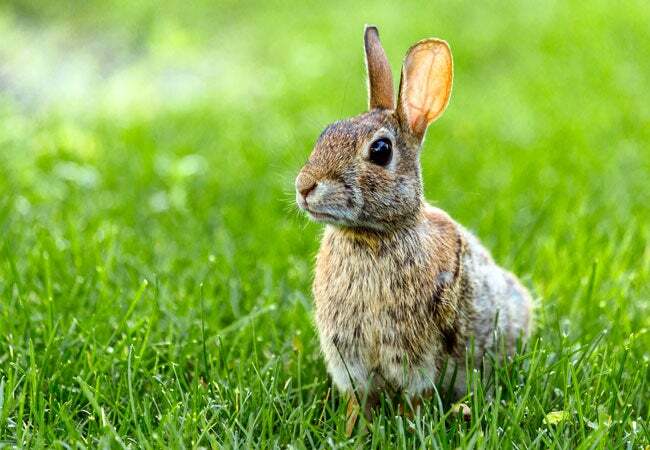 Preventing an infestation of rabbits begins by properly maintaining your lawn and garden. Mow your grass regularly (about once a week), and don’t leave clippings around for rabbits to nosh on. Then, stay on top of yard maintenance tasks, like pulling weeds and trimming overgrown vegetation. Remove piles of wood, sticks, branches, trimmings, and debris—all of which provide the perfect hiding places for rabbits. Search your property for burrows and holes. These could indicate the presence of rabbits, which take cover in the holes during cold or rainy weather. Fill the burrows with gravel or dirt. Despite homeowners’ best efforts keeping a well-manicured yard, this strategy alone may not always deter them. 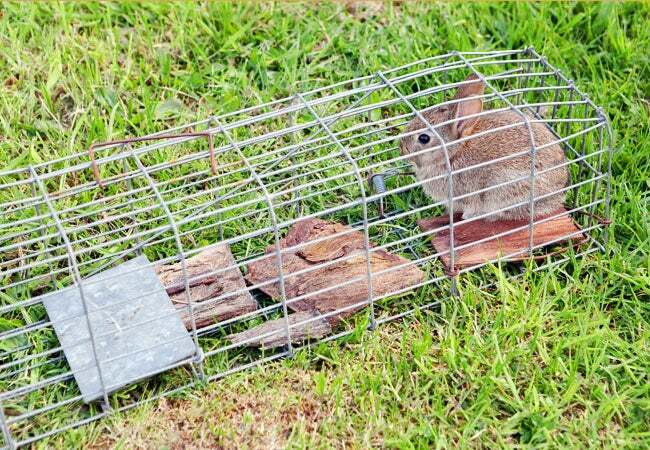 Humane traps offer an effective complementary solution for small numbers of rabbits that still roam your property. By catching the animals, you can then release each somewhere far from your yard so they don’t wander back. Buy a “live trap” or “cage trap” fit to catch a three- to four-pound rabbit from a home center; these medium-sized traps generally cost around $40 or $50 (view example on Amazon). Take a minute now to pull on gloves before handling the trap, as rabbits may pick up a human’s scent and avoid the cage. Then, following manufacturer instructions, set up the trap in a shady, sheltered area of your yard, preferably near vegetation. Place lettuce and carrots in the trap as bait. Check the cage multiple times per day. A rabbit or other small animal entering the cage will trigger a mechanism to snap the door shut without harming the animal. Being trapped in a cage causes stress for a rabbit, though, so you’ll want it to spend a minimum amount of time inside before you’re ready to release it. Find your live trap filled? To get rid of rabbits, take the trap to a wooded, grassy area at least five to 10 miles away from your home, then release any animals caught. Perhaps the best method to ward off large numbers of rabbits involves fencing. Following the steps below, a homeowner can install their own backyard barrier. Purchase chicken wire fencing and stakes (either wood or metal) from a home store. 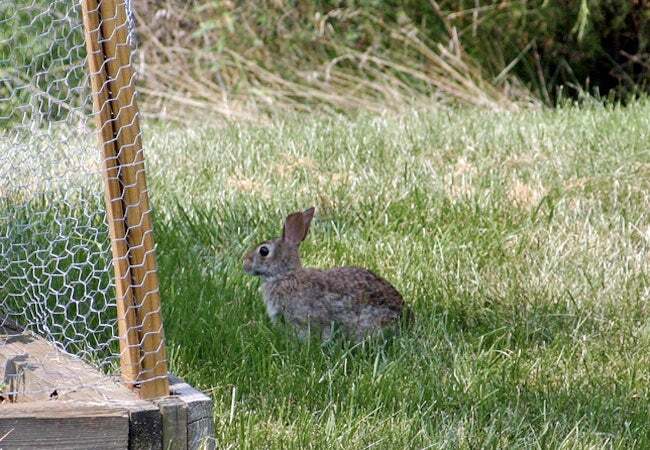 Make sure that the mesh holes in the chicken wire have a maximum one-inch diameter; some adult rabbits can squeeze through anything larger than that. Back at home, plan out the area you intend to fence. Rabbits can navigate under shallow fences, so you’ll want to dig a six- or eight-inch trench along the planned perimeter. Later, you’ll bury the fence inside the trench. Cut the chicken wire to size with wire cutters. For maximum efficiency, you’ll need fencing to extend 36 inches above the ground and six or eight inches beneath (depending on the depth of the trench you dug in Step 1)—that’s 42 to 44 inches tall by the length of the perimeter. Working along the perimeter, drive a stake into the ground every six feet, using a hammer. This distance will ensure the chicken wire will remain strong and taut, preventing sagging that may potentially let rabbits through. The stakes should be four feet tall, with one foot underground and three feet above ground (the same height as the chicken wire fence). Fasten the sheets of chicken wire to the stakes with staples or hooks. Ensure there aren’t any gaps by overlapping the wire pieces where necessary and securing the edges to the stakes as best as possible. If desired, install a garden gate. The frame can be constructed with four pieces of 1×1 lumber attached together with wood screws; the sides pieces should be the same height as your fence (36 inches), while the width of the top and bottom pieces can vary based on your preferred gate size. Staple chicken wire to the interior of the frame, then attach one side of the gate to a stake with hinges. The other side of the gate can be attached to a stake with a latch, with which homeowners can open and close the door. Since rabbits can dig underneath the gate, you’ll want to bury a piece of metal flashing vertically six- to eight-inches underneath it. That way, any rabbit who tries to go under the gate will hit a wall. Fill the trench you created in Step 1 with dirt or soil, packed securely together so the fence doesn’t wobble in the wind. Every few days, check your fence for signs of weakness—particularly along the bottom and the stakes. Keep spare chicken wire for bolstering and patching as needed. • If you’re using the repellent on produce in the vegetable garden, ensure the product is safe to use and won’t affect the flavor of your food. • Weigh the pros and cons of water solubility for your property, since water soluble repellents may be easier to apply but more quickly dissolve from hose or rain water (and therefore require lots of reapplication). • Avoid high-toxicity products if you have children or pets playing the yard. Once you choose a product, apply it per the manufacturer’s instructions and follow up accordingly to keep pests out of your yard and garden all season.